On a summer’s day when the sea and the sky are a matching blue and the whole world sparkles, there’s nothing as inviting as donning a snorkel and taking a swim across the bay. This summer, for the first time, Junior joined me in my forays over the rocky reefs. While he built up experience, we floated shoulder to shoulder and sculled our way over the waving seaweed to the deeper gullies. On our third snorkel outing, I was enjoying the sun on my back and the gentle roll of the waves when Junior screamed down his snorkel. I grabbed his arm in case he was hurt, but he was frantically pointing and making the “fish’”sign with his hand. He had just seen his first ballan wrasse. The fish was a full-sized adult, maybe 40 or 50cm long with a thick body and a criss-cross patterns of lines interspersed with pale blue spots. An impressive fish. Undeterred by Junior’s shriek of excitement, it carried on its slow, hovering path through the kelp-lined gully for a while before darting away as we neared. Juvenile ballan wrasse can be bright green like this one, but they grow up to around 50cm long when they’re mature. On the same venture, we spotted barnacles feeding with their feathery legs, shore crabs strolling along the sea floor, a shanny surveying its territory from the top of a rock and great glistening shoals of sand eels rolling by. On other days, we came across groups of corkwing wrasse with pouting lips and turquoise-striped faces, spider crabs lurching through the kelp, and tangled snakelocks anemones spreading their green tentacles. Nearby, crowds of tourists paddled and swam, oblivious to the beauty below them (or the pinching claws and stinging tentacles near their feet). This summer has seen waves of jellyfish drifting through, from comb jellies to the harmless moon jelly, the less harmless blue and compass jellies and the enormous barrel jellies. Some days the sea was thick with jellyfish, but this didn’t stop Junior from mastering the art of catching waves on his bodyboard or wiping out headfirst into the blue-jelly-soup. He swam for the shore in a hurry on one of our snorkel safaris though, when a compass jelly brushed over my face and stung my back. I have almost no photos of our snorkelling expeditions this year. Next year, when Junior is more confident, I’ll be able to carry a camera, but this season we just revelled in the perfect days and soaked up the sun . As we knew it would, the summer ended abruptly, dissipating like a mirage from one day to the next and the water is no longer so inviting. For now, we are hanging up our snorkels and returning to the rock pools, exchanging beach shoes for wellies as the autumn chill moves in, but there is everything to look forward to. A week of Shoresearch surveys starts tomorrow in Looe, which is guaranteed to bring new finds and lots of species records for Cornwall Wildlife Trust. The empty beaches make this a wonderful time of year to explore the rock pools and before we know it, the first of the autumn storms will blast in, washing who knows what onto our shores. Watch this space! Between the snorkel trips, I did squeeze in some rock pooling. Here are some of my favourite photos from the summer. Doris ocelligera sea slug – I recorded these for the first time a couple of months ago and have found them regularly in the same spot this summer. 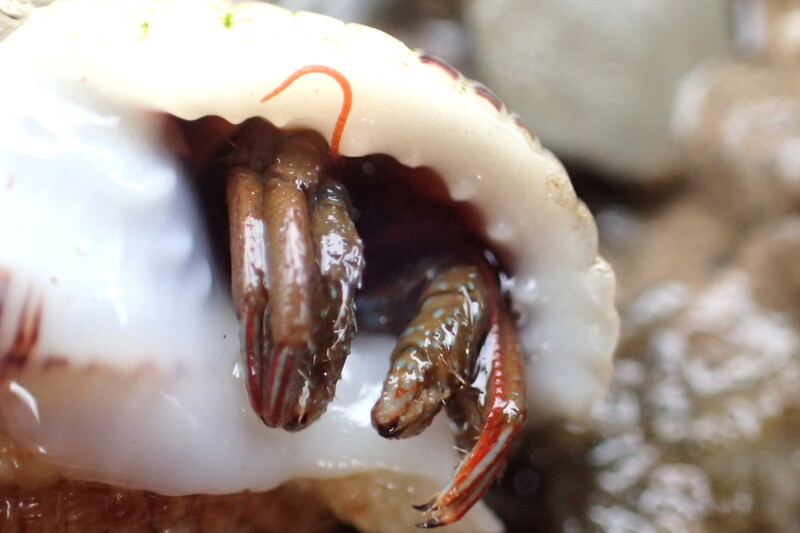 St Piran’s hermit crab – now a common find on all our local beaches. A day at Kynance Cove on the Lizard Peninsula has become a fixture in the Cornish Rock Pools calendar. The smooth, serpentine cliffs don’t create many hiding places for marine life, but Junior loves the geology and caves. There are always creatures to see too if you look carefully enough, so I take the opportunity to relax in the sun, staring at fish through the clear water. There’s one pool in particular that I like to visit here. It is more like an aquarium than any other I’ve found; just deep enough to house a whole community of small blennies and always buzzing with life. The funny thing is that, while I stare in, the fish stare back, creeping closer up the sides, over pink encrusting algae and through fronds of the Corallina seaweed to secure a better view. Bold young shannies, prop themselves up on their two-pronged pectoral fins, swivelling their colourful clown eyes to observe me. Being watched… a young shanny (common blenny) edges up the side of the pool to take a look at me. Kynance Cove, Lizard, Cornwall. In the far corner of the pool, a Montagu’s blenny pops up to say hello. 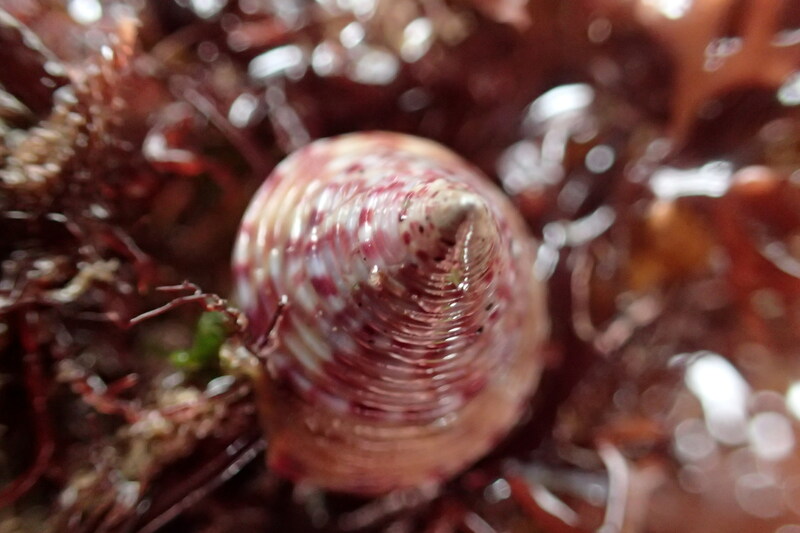 It’s easily recognisable by its pronged head tentacle, which looks like a tiny Christmas tree. The Montagu’s blenny almost gets out of the water to take a look at me. Kynance Cove, Cornwall. The surrounding rocks are covered in barnacles, which suits these fish well. The Montagu’s blenny likes nothing better than to nibble the feeding legs off barnacles. I soon start to doubt that this fish is just curious. Unlike the shannies, which are just juveniles, this Montagu’s blenny is full size and sports a fine pattern of turquoise spots on his body. It is the male blenny’s job to guard the eggs, and this fish is taking no prisoners. This bold Montagu’s blenny has striking blue spots and a dark stripe through its eye. He seems determined to chase me out of his territory, repeatedly headbutting my camera. He may only be 7cm long, but I have a feeling that if I put a finger in the water he won’t hesitate to take me on with his sharp little teeth. Blennies’ thick lips make them look like they’re smiling, but this Montagu’s blenny just wants to attack my camera! The hard rock becomes uncomfortable to lie on after a while, digging into my legs, but I try not to change position. The fish will scatter if I make any sudden movement or noise. Half a dozen shannies are darting around the bottom of the pool, while others are basking in shallow grooves at the edge. The Montagu’s blenny doesn’t take his eye off my camera. I watch him until the tide turns and the waves begin to sweep in. This may not be the most diverse rock pooling beach, but the fish are a joy to watch and it’s a wonderful spot to while away a sunny morning before enjoying a pasty in the café. Summer starts here! Kynance Cove – always a hit! A close (enough) encounter with Weever fish. We’re on a stomp about the beaches between Looe and Seaton, enjoying a patch of sunshine. “Watch out for Portuguese Man O’War jellies,” I warn Junior as we cross the muddy sand at Millendreath. I know there have been reports of them washing up all around the south west coast over the last few weeks, but there are none today. Inevitably, it’s something else that nearly gets me. In a sandy pool at the sea’s edge, a flicker of movement catches my eye. It happens so quickly I can’t be sure there’s anything there but the sand is settling, suggesting something has just buried itself. I call Junior over to look and I crouch low, reaching a hand to the water’s surface. If I can scoop the sand up from underneath I might be able to gently lift out the creature. Having seen plenty of well-camouflaged dragonets scooting about the pools today, I expect this to be another one. I stop short and stare into the shimmering pool. 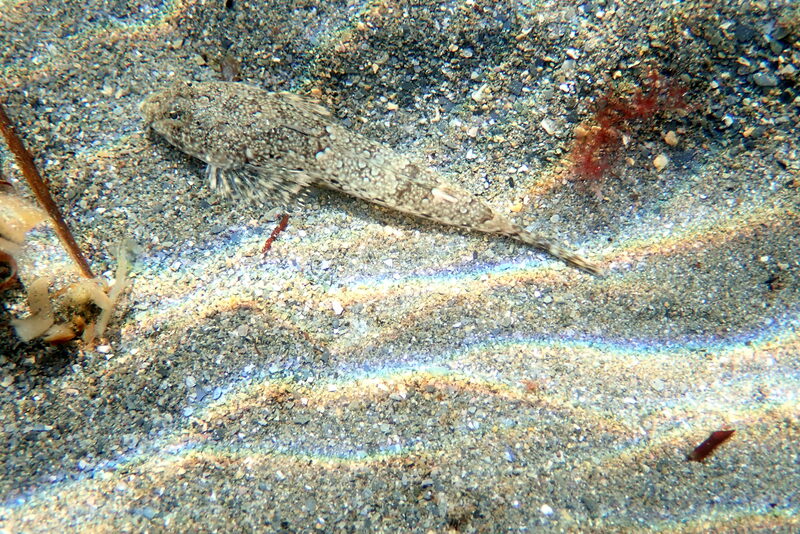 Dragonets, especially the females, are perfectly camouflaged on sand. Last week I shared with you the miniature world of the sea slugs, so this week I’ll super-size things and bring you some big fish. Silly-season reports of Great-white sharks often hit the headlines in Cornwall, but I prefer rock-pool giants; they’re not made up, and you can get close to them without having your leg bitten off! Cornwall is brilliant in all sorts of ways, our network of local, grassroots marine conservation groups being just one of them. The public launch, last week, of the new Three Bays Wildlife Group brought experts and volunteers together and gave me a chance to explore some new beaches in the St Austell area. Judging by the squeals of excitement from the children and adults alike, the crabs, pipefish, prawns and anemones we found at the main rockpool ramble on Portmellon beach near Mevagissey went down well. By the end of the day, the local group had recruited lots of potential new volunteers. Green shore urchin adorned in seaweed. Portmellon beach.